The included TurboBrush® Tool, features an air driven rotating brush. This tool can clean smaller and hard to get areas, such as upholstery, stairs, and under furniture. The Turbo brush can pick up dirt, dust, and pet hair. Bissell 1831 Vacuum Tools: TurboBrush® Tool, Dusting Brush, Crevice Tool, and Extension Wand. Vacuum Cord Length: 25 feet. Upright Vacuum Warranty: 2 years. Upright Vacuum Weight: 15.4 lbs. Smart-Review Commentary: The Bissell Cleanview 1831 is a low cost bagless upright from Bissell, yet it has all the basic features you would expect from an upright. 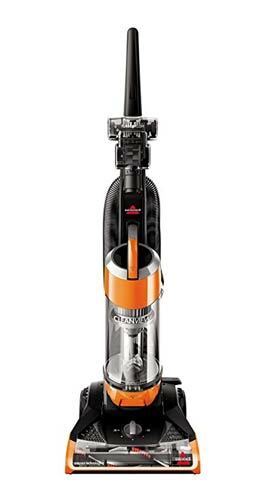 This model features the bissell One Pass Technology to clean carpets in one pass. Multi Cyclonic action spins the dirt and dust into the dust bin instead of the filter or back into the air. The multi level filtration will prevent dust and dirt from getting back into the air as you vacuum. The vacuum includes 4 tools, including a mini TurboBrush® tool for cleaning pet hair, dust, and dirt from stairs, and upholstery. This Bissell model has received excellent reviews by consumers and is a Smart-Review top pick and a great value for an upright vacuum under $100.